Kiwis have been feeling the heat - but last month was only the third hottest January with 2018 still holding the record for the hottest month ever. 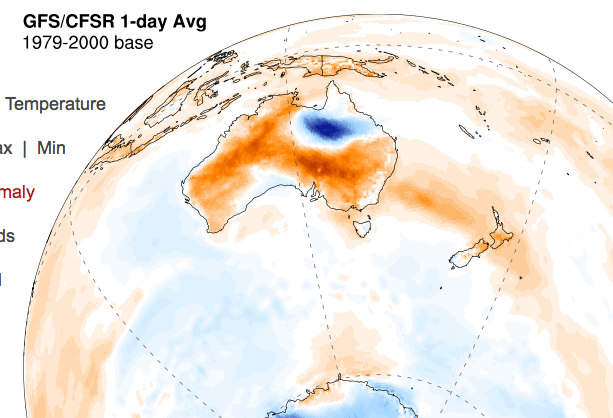 The monthly climate summary for January released by the National Institute of Water and Atmospheric Research (Niwa) shows the nationwide average air temperature last month was 18.8C. But despite Kiwis sweltering and some places experiencing a heatwave at the end of last the week, January 2018 holds the record the country's hottest month since records began in 1909 with an average temperature of 20.3C. It's certainly been hot with the six main centres - Auckland, Tauranga, Hamilton, Wellington, Christchurch and Dunedin - all recording a mean temperature well above their average. Niwa Auckland climate scientist Nava Fedaeff said last January was exceptionally warm and broke all records. "Obviously we've just come out a heat wave so it's certainly been very hot at the end of the month, January last year was actually much hotter - consistently hotter." Fedaeff said while February was starting off hot there would be a few more "ups and downs" than January. Likewise Auckland, Tauranga, Hamilton and Wellington all recorded rainfall well below normal. 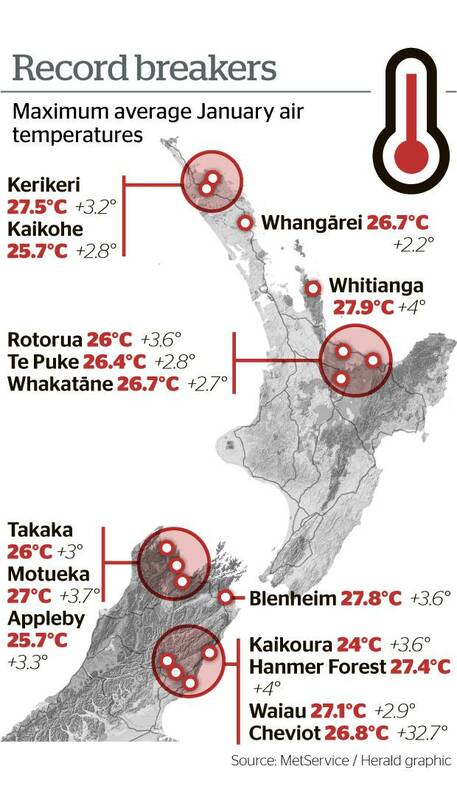 But some parts of the country cracked their mean air temperature records with Kerikeri (21.3, up 2.2C) , Rotorua (20.1C, up 2.6C), Mahia (20.3C, 2C), Kaikoura (19C, up 2.3C) and Cheviot (19.8C, up 3.1C) all claiming their hottest month ever. Hanmer Forest in the South Island was the hottest place to be in January with a temperature of 38.4C recorded on 31 January. "That's actually New Zealand's 18th warmest temperature ever recorded so it was a very hot day." Maximum January air temperature records were broken in a raft of places including Kerikeri (27.5C, up 3.2C), Kaikohe (25.7C, up 2.8C), Whangārei (26.7C, up 2.2), Whitianga (27.9C, up 4C), Te Puke (26.4C, up 2.8C), Whakatāne (26.7C, up 2.7C), Rotorua (26C, up 3.6C), Takaka (26C, up 3C), Motueka (27C, up 3.7C0, Appleby (25.7C, up 3.3C), Blenheim (27.8C, up 3.6C), Hanmer Forest (27.4C, up 4C), Kaikoura (24C, up 3.6C), Waiau (27.1C, up 2.9C). Cheviot (26.8C, up 3.7C) and Mokohinau (23.8C, up 1.6C). Appleby and Richmond also recorded the 350 hours of sunshine making it the sunniest month ever recorded in the South Island. New Plymouth holds the national record with 356 hours of sunshine in January 2015. Parts of the country were also extremely dry with rainfall well below normal in all parts of the country except Napier and Hastings. Masterton had just 6mm of rain and recording its driest month on records since its records began in 1926. Cape Reinga also only captured 4mm of rain making it its second driest month since its records began 100 years ago.